When you’re buying nail polish and the checkout associate ooohs and aaahs over your choices – you’re on the right track. That’s what happened when I brought these beauties home. As I looked through the nail polish at Walmart I considered what colors would work nicely for fall. At first, I was not finding my colors. None of the greens were appealing. They seemed too St. Patricksy. All of the other oranges looked too pumpkiny. The tans were boring. 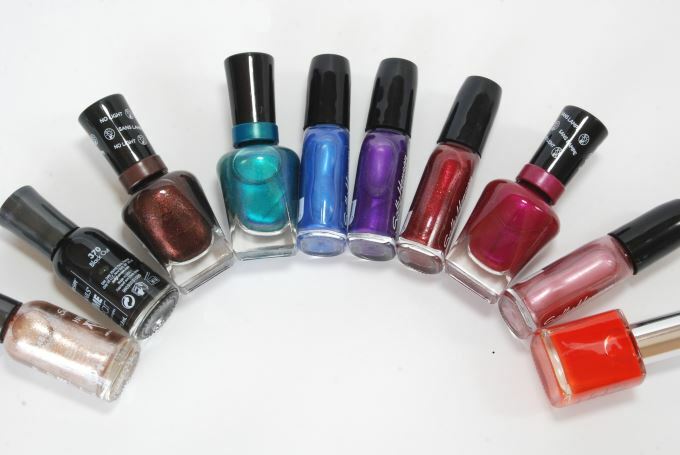 So here are the nail polishes that stood out to me. Now this one, this speaks to me – such a nice pleasant gold. It’s more classy than a typical trophy gold. This is a flat black – so not my thing, but very popular still these days. How in the world did the black nail polish trend start, I ask? I’m going to guess it was a celebrity. Isn’t that how all trends start these days? I was only focused on the colors until my daughter pointed out at home that they were mostly Sally Hansen™. Sally is making a LOT of money. Just sayin. I was surprised at how expensive the Miracle Gels are! It has a metallic/semi glittery sheen to it. Very luxe. All of the Miracle Gels™ are luxe. Yes, that’s how it’s spelled. Again, these Miracle Gel’s™ don’t come cheap but they’re stunning. Gotta have the personality or outfit to pull this off. Definitely a statement color. This photographed like it’s a royal blue – but it’s darker than this. The photo just doesn’t do it justice. You have to see it in person. It’s an amazing blue with other tones in it. It’s magical. It belongs in the Miracle Gel™ price range because it’s so stunning. All right, I’ll stop gushing over it. This is truly a royal purple. Nuff said. Metallicky. Dark and mysterious. Nice for Christmas too. This has some magenta in it. It has some wonderful tones in it. This is a nice neutral color for fall. It’s not a brown – more like a mauve. If you will excuse me, I’m going to go treat my toenails to some Sturdy Sapphire right now. They deserve it. I’m in love. OK no more gushing today, I promise. « What Does This Donut Look Like to You?